The January 2018 forecast-5 shows a $21M deficit an updated one received in October 2018 shows $26M. Please provide ALL documents that show any changes to the 5-year budget that was approved August 15, 2018 or any other documents that show how you plan to balance the budget. see attached screenshot from 1/31/2018 presentation. On page 15 the sum for years 2019 to 2023 of “Surplus / Deficit Incl Other Fin Sources” is -$20,736,934 or a $21M deficit of the next 5 years based on the January 2018 report. 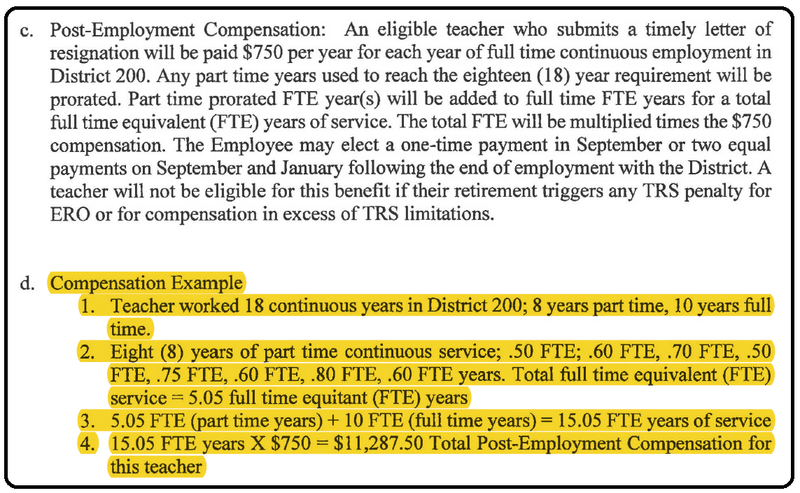 Since then, a new teacher contract and administrator contracts that are more generous than originally assumed, have been signed. on page 16, the low point for fund balances is negative in FY-2020. I copied the data from the Oct 2018 forecast-5 chart into excel and highlighted cells that changed since the January 2018 version. Also added a column “Sum of Row” which is a total for years 2019 to 2023. The most important one is “Surplus / Deficit Incl Other Fin Sources” which shows a total 5-year deficit of $26,011,650 in the October 2018 forecast. Note: the districts fiscal year (FY) runs July 1 to June 30. Property taxes are due in June and September. As a result the low point for cash on hand is end of May. District 200 has been running around $15M cash on hand at the end of May. That will NOT cover a $26M deficit. So yes, while “Jefferson is in the budget,” D200 does not have the funds in reserve to cover their planned deficit. How Much Will a New Jefferson Really Cost? As attached to the 8/15/2018 board agenda Action Item after the closed session. On page 3 we found what the district anticipated had they gone ahead without the referendum. in the 8/15/2018 board packet, (item 2 in Action Items after the closed session) lease_certificate_resolution pdf page 5. The Certificates shall become due and payable serially or be subject to mandatory redemption (subject to option of prior redemption as hereinafter described) on the dates of each of the years (not later than 2038), in the amounts (not exceeding $1,200,000 per year) and bearing interest at the rates per annum (not exceeding 5.00%) as set forth in the Certificate Notification. The $1,200,000 is for principle + Interest. Verbally they were talking $1M/year. Borrowing $14M and paying back $1M/year for 20 years is a total payment of $20M or $6M in interest. If it is $1.2M/year for 20 years that is $24M or $10M in interest. Based on what bonds have been selling for, 4% interest and $1M/year is more likely. “owner’s cost” to include removal of old Jefferson, landscaping, furnishing the new building and storm water retention. The difference between $14M and the $13,675,000 being borrowed is $325,000 which is most likely the cost of issuing the lease certificates. Our original guess for interest was $6M. 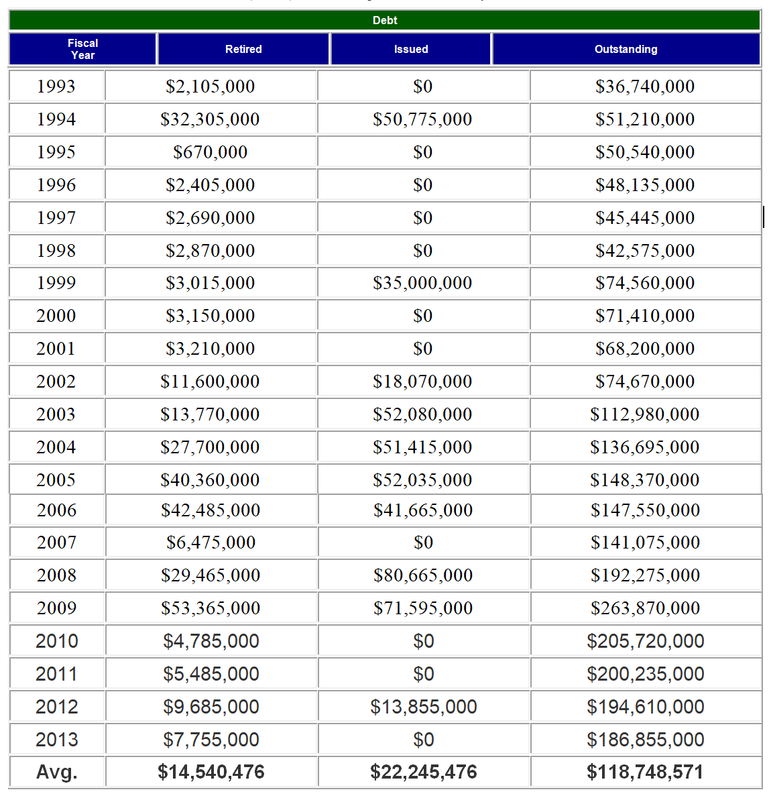 We updated it to $6.5M based on this document ($6,231,936.11 + $325,000). 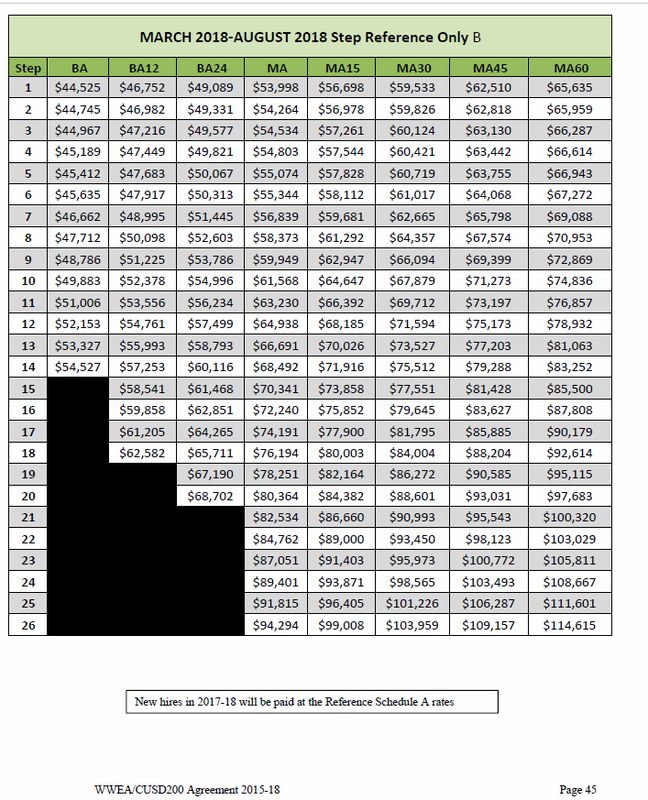 Since i have not confirmed the $325,000 as being a cost… I decided to not include it. Note: the cost is a close estimate based on district data. Actual cost will be determined when/if certificates are actually sold. Someone posted a link to ballotpedia’s entry for Wheaton-Warrenville CUDS 200 on social media. I took a look. There is some nice historical data there. 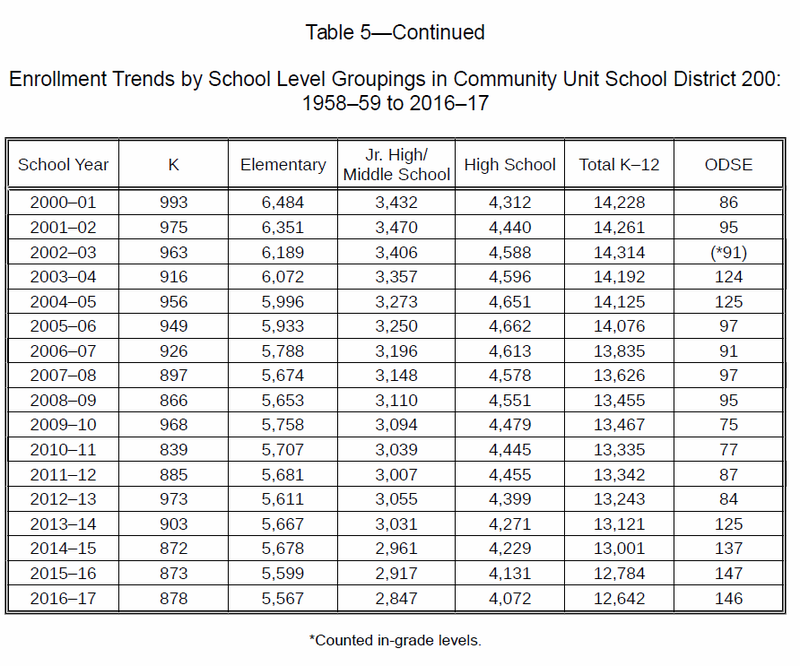 If you have lived in CUSD 200 for two decades or longer, and “feel” like school taxes have gone up faster than inflation, you have good reason. The number of students in the district does not account for this large budget growth. 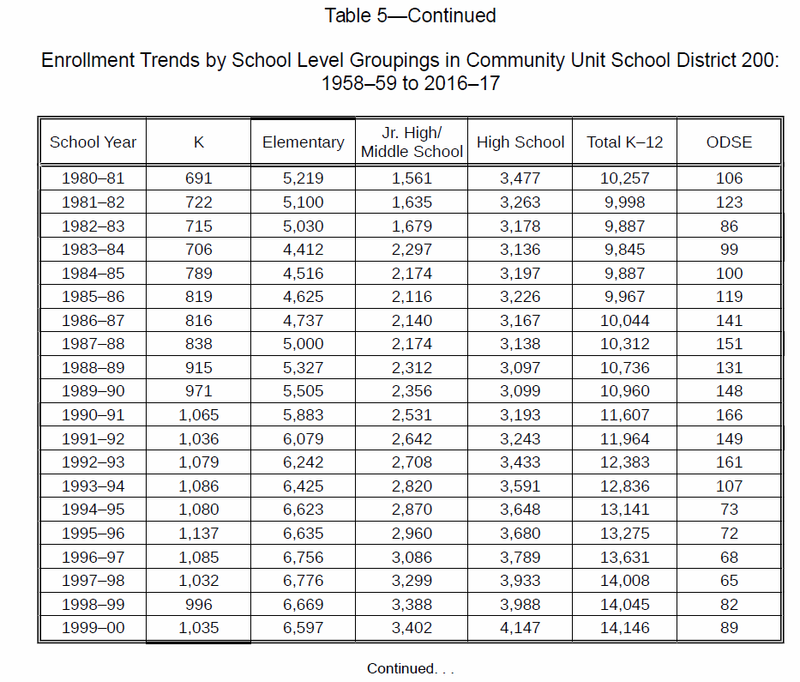 From the CUSD 200 Demographic Trends and Enrollment Projections, June 2017 report by John D. Kasarda, Ph.D., in 1993 the total enrollment in D200 was 12,383. Enrollment peaked in 2003 at 14,314. In 2013 it was at 13,243 and in 2017 had dropped to 12,642. Community Unit School District (CUSD) 200 has been in the news, and they are now planning to try a third referendum to build a new Jefferson Pre-school. When-&-Why has a board member voted “NO” over the past five years? I searched my notes, this website and my memory, for votes that were not unanimous – for good chances for D200 to save money that were not taken. I remembered one that was not already documented, so I found the video, watched it, took notes and will cover it in detail first. The others will be listed with links for more info. June 04, 2015 – special meeting to approve the 2015-2018 WWEA teachers’ contract. “How does paying more money to the same adults for doing the same job do anything for the children?” Salary spikes should never have existed. Now the end of career bonus –That should have never existed. She mentioned two administrators, Sorrick and Belha, who ended their careers with 20% 0% 6% 6% salary increases. It appears they put in for their end of career 20% then stuck around for three more years and then put in again for their 6% end-of-career spikes. We have a right to know exactly what is in that contract. Board member should have been on that negotiating team. There was absolutely no taxpayer representative on that negotiating team. It should not be negotiated behind closed doors and the board given a yes/no vote. A 25 year teacher is not worth two-and-a-half times a new teacher. “Total salary increases approaching $6 million. Total salary percentage increase that could reach 8.5%. a 50% increase in post employment payments. The WWEA contract was finally posted on June 26, 2018 – the day after I FOIA’d it for the second time. 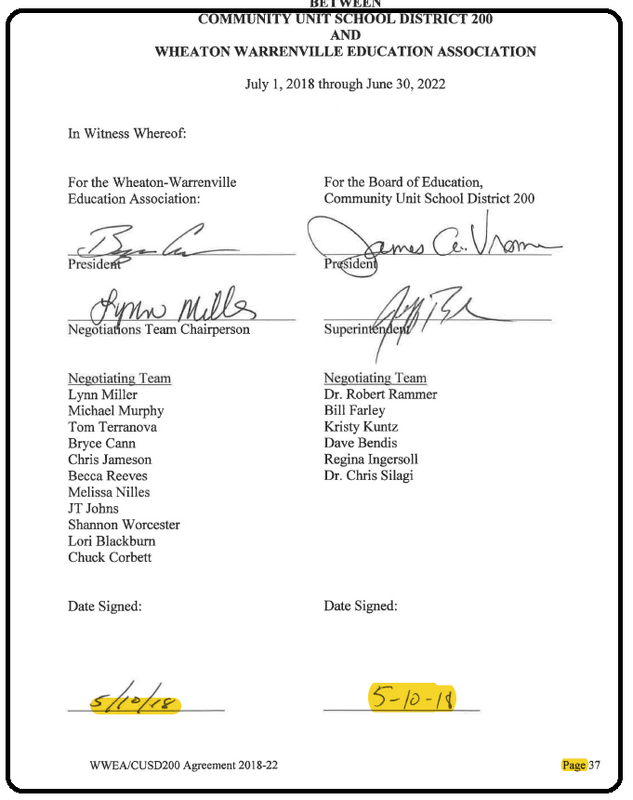 The signature page (pdf page 39 of the contract “Wheaton Warrenville Education Association (WWEA) 2018-2022”) is dated 5/10/2018. It was already signed when I put in my first FOIA (On May 12th) – WHY WAS I DENIED a copy in the May 21st FOIA response? What took so long to post it? Also the Daily Herald had a cost estimate. Neither the contract, nor the approved highlights had that. It is so wrong to approve a contract without having the actual contract to read – especially since new un-approved perks have been slipped in. What is meant by “…, may donate up to three (3) of the those days to the Sick Leave Bank.”? For whom? What general sick leave bank? And this was NOT approved! It should be pulled. 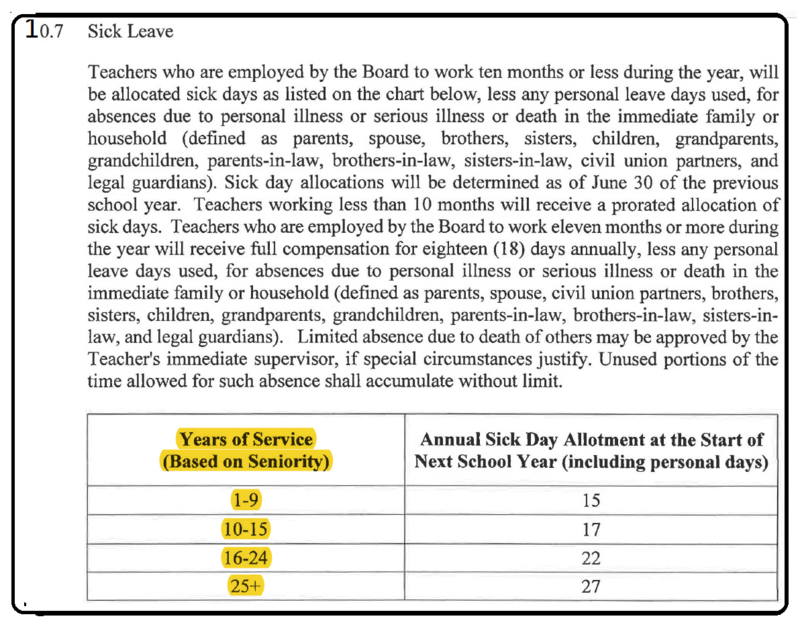 Extra sick leave days are now based on years of service rather than the number of days in the bank. Those who actually use sick days will get more days this way. Those who use none will take a minimum of 20 years (rather than 19) to reach the magical 340 mark. In the contract that ended 2015, all full-time employees received 15 sick days per year. It took at least 23 years to accumulate 340 days for 2 years of service credit for pension computation. This change was NOT in the approved highlights. It should be pulled. In my opinion, extra sick days should NEVER have been given! They were never approved for the 2015-2018 contract! The new UN-Approved method will give more than twice as many employees extra sick days and will allocate more than double the number of extra days! 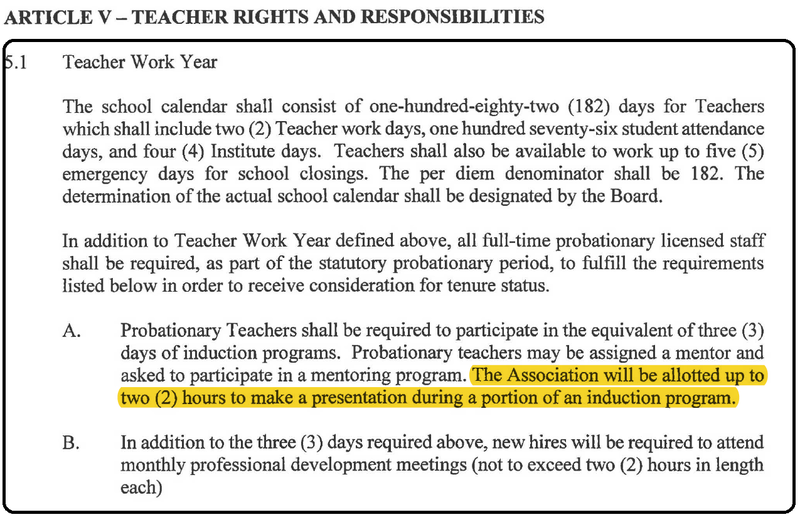 Projections based on FOIA date using Old (approved method) will give a total of 1,940 extra days to 295 teachers. The new method will give a total of 4,393 extra days to 728 teachers. The extra days will allow for more days off (and cost the district for a Substitute teacher) or they may be used to pad service credit in computing the pension for life. 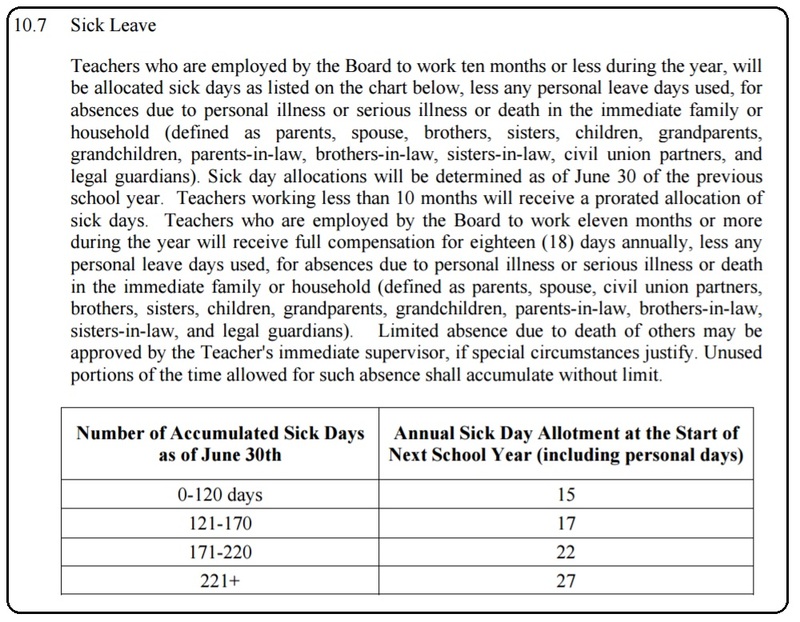 Thank goodness the district no longer lets employees cash in unused sick days t the current per diem rate. From the WWEA 2018 – 2022 contract (new): The charts have ben removed. 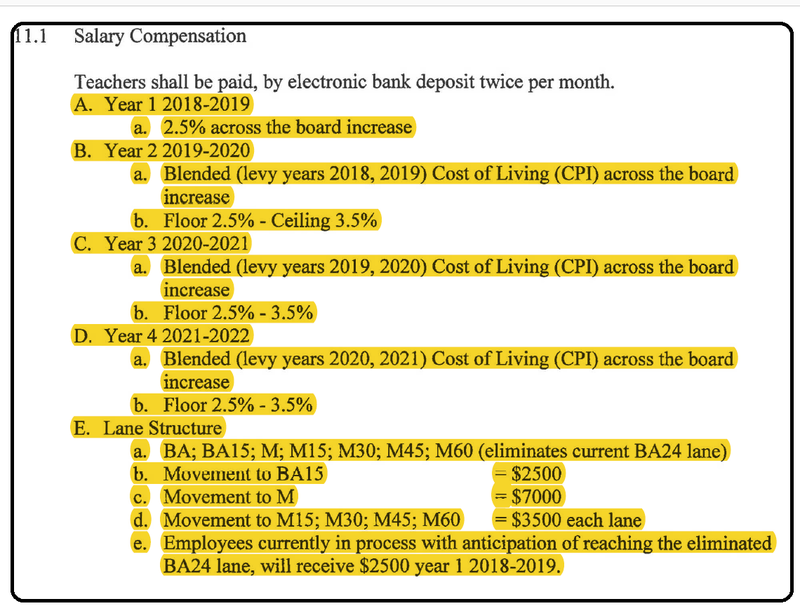 Instead, one fewer lanes, Lane changes are worth a constant amount (rather than percentage), No more “steps” but everyone receives the same percent increase (steps are baked into current salary which drives future salary) – This change was in the approved highlights. 1132 Employees had a salary rate in the range $1 to $39,999 school year. From the WWEA 2018 – 2022 contract (new): Extra money for directly applicable education – This change was in the approved highlights. Tom Terranova woeks for the IEA (not the district). He represents the union. Bryce Cann is CUSD 200’s district union rep. CUSD 200 pays his salary as a teacher, but does he teach any courses? The others on the “union side” are teachers. On the Admiistration side are administrators and principles – No school board rep, no taxpayer rep. Frequently, perks given to teachers will also be given to administrators. Since there are changes made, but NOT approved, the board should either change the contract to match what was approved. Or take a new vote to approve what they signed. Technically, what they did, does NOT appear not legal.